If you travel a lot or like to feel free (of carrying a handbag!) 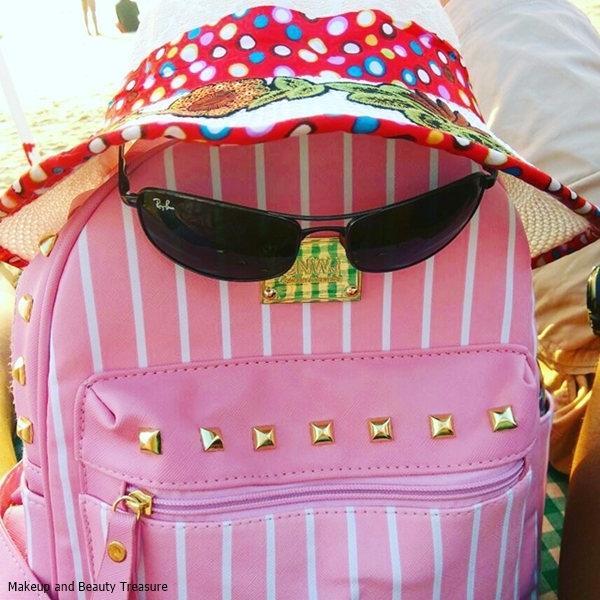 on your vacation, a backpack might be your best friend. I was on a 4-day trip to Goa and believe me, this backpack was so convenient to carry! Few months back, I had reviewed Zaful Tassels Backpack which is almost similar to this backpack but this one has 2 more bags inside it! 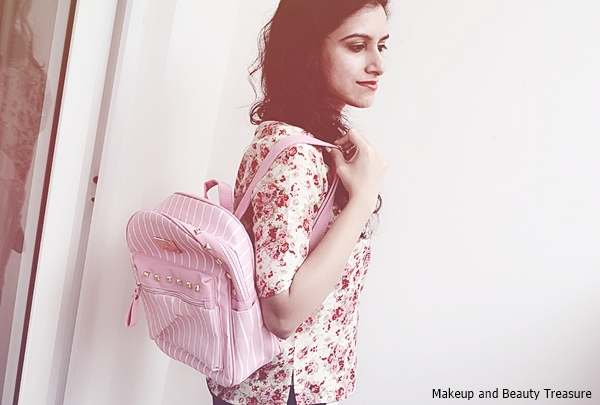 Read till the end to know my thoughts on this cute, girly backpack! Miss Baggie chilling at the beach! Here are the 3 bags! 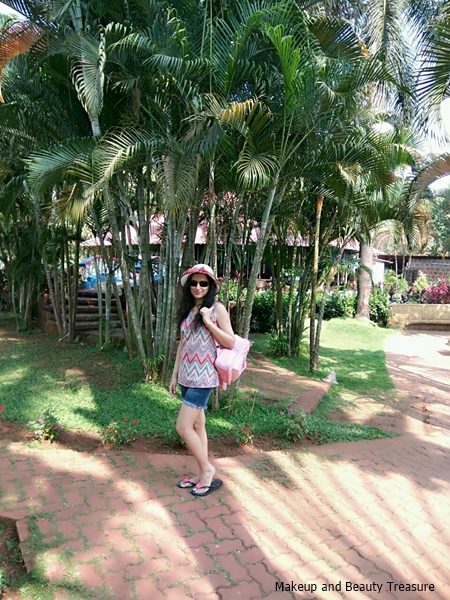 I took it with me to Goa! Perfect to carry on vacations! The bag comes in 4 colors- black, blue, light gray and pink. All the colors are pretty but being a pink lover, I chose the pink bag! The backpack is made of PU material and definitely of good quality. It is 30-50 cms in length and is perfect to carry all your essentials in it! As soon as you open the zipper of the backpack, you will find a cross body bag and a wristlet. The backpack has lovely detailing of rivets with white stripes that make it look unique and attractive! It has no compartment but there is an inner zipper and 2 pockets for keeping your mobile or other stuff! There is also an outer pocket where I keep my hair ties, chocolates, pen, keys and other small stuffs! There are also 2 small side pockets where I keep my small Bisleri bottle! There is also a zipper pocket at the back to store anything that you need to hide from others *winks*. The crossbody is quite small as per my liking but it is great if you need to carry only mobile and cards on-the-go! It has an inner zipper where you can keep small stuffs like jewelry, cards or keys! The size of the strap is great and hangs comfortably across the body! The wristlet is slightly smaller than the cross body bag! It has a push button that reminded me of my old school bags! There is no compartment or inner zipper pockets in it but you can easily carry cards and cash in it! I am totally in love with this set of bags from Zaful! I have shopped a couple of times of Zaful and it never disappoint me! I was not charged with customs and the package reached at my place safe and sound! The bag set is of great quality and indeed look unique! I would highly recommend it to all girls! I carry this pretty backpack each time I travel and I shall definitely repurchase it once it will get old! This bag is too spacious too,.. Nice bag,. Yes I can easily put all my essentials in it!